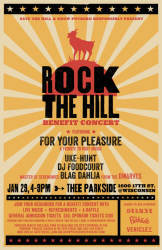 Please join Save The Hill and Grow Potrero Responsibly at this community fundraiser for our court case. Festivities will include live bands, delicious refreshments, and raffle tickets for exciting prizes. Attending this event is a great way to show your support for our shared cause - while partying alongside your neighbors. All money raised will go towards our legal fund. Spike Slawson (Me First & the Gimme Gimmes, Swingin' Utters) on ukulele and vocals, Jamin Barton (Kelley Stoltz, The Titan Ups, Ramshackle Romeos, Bone Cootes and the Living Wrecks) on saxophone, melodica, harmonica and various other hanky instruments, Atom Ellis (Psychefunkapus) bass and backing vocals, and on the skins, Prairie Prince (The Tubes, Journey). Uke-Hunt play outsider pop tunes, country standards, '80s new wave hits, and tender love ballads all totally unplugged, yet fully electric. More mobile than an Airstream, Uke-Hunt can be wherever they're needed before you can say ukulele! 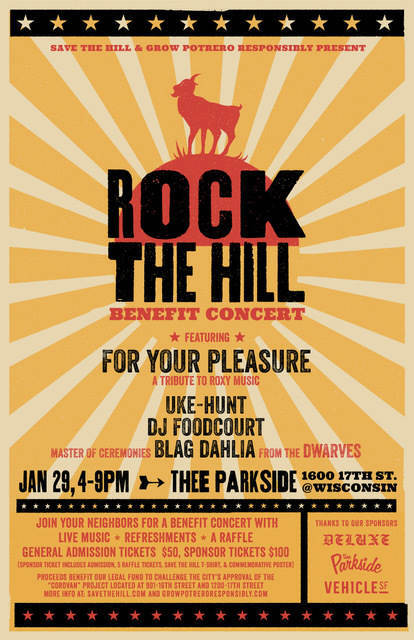 Save The Hill Sponsor Ticket: $100 - Being a sponsor not only means that you are a great person, but it also includes admission to the event, a "Save The Hill" T-shirt, a limited edition "Rock The Hill" poster and (5) raffle tickets for the chance to win some amazing prizes!!! Pacific Rolling Mill - Potrero Hill, San Francisco from GLISAN MEDIA on Vimeo.